Dramatic countdowns, colorful fireworks and chances of getting away with serious riches are all signs that 2016 is upon us! 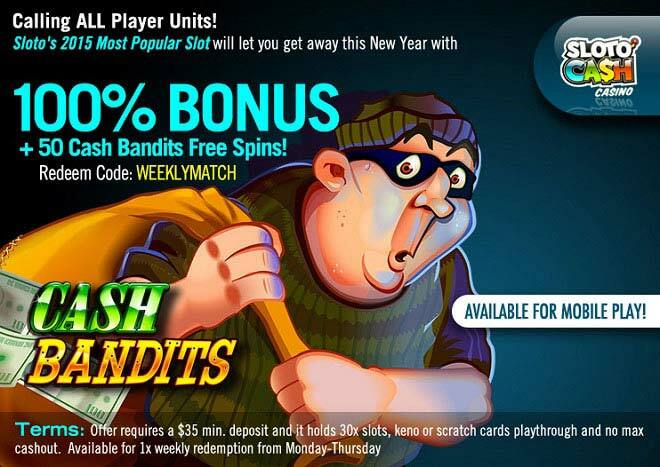 Kickoff your New Year by depositing as little as $35 and playing our most popular slot of 2015 with a 100% Bonus + 50 Cash Bandits Spins! Run from the Sloto'Cash police with tons of dough when you hit the spin button of Cash Bandits! With 5 reels and 25 paylines you'll find plenty of places to hide and collect loot! Land your wins right away with symbols such as the wild Bank Vault Door, the scatter Cops and Robbers badge symbol, the red getaway car, the loudspeaker, the donuts, guns, bags of cash and other special Cash Bandits features! Outrun the cops this 2016 and break into Sloto's vault where you'll be able to play with a 100% Match + 50 Cash Bandits Spins!